FIRST GRADE TEACHER DR. GARY WELLBROCK CREATED BROADWAY BOOKS FIRST CLASS. 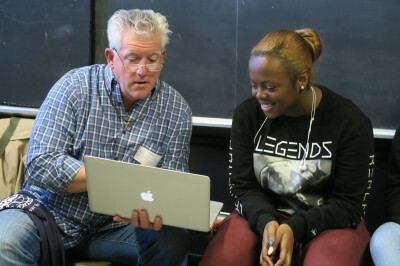 WE ARE NOW EXPANDING IT TO STUDENTS GRADES 6-12 AT BROOKLYN SCHOOL FOR COLLABORATIVE STUDIES. THE PROGRAM NOT ONLY INVITES BROADWAY PERFORMERS TO COME, READ, AND DISCUSS THEIR CAREERS, IT IS ALSO A TOTAL TECHNOLOGY AND ARTS AWARENESS PROGRAM. EACH PERFORMER IS DISCUSSED BEFORE THE VISIT TO PREPARE THE STUDENTS AND AFTERWARDS STUDENTS ARE INVITED TO WRITE ABOUT THE EXPERIENCE. IN ADDITION, STUDENTS WRITE THANK YOU CARDS TO THE GENEROUS PERFORMERS.